Hi all! I started this challenge a couple days ago. I only have two pictures to show, and that will be the part of my first chapter of gen 0. Nina Mozzarella has just found her own place to live in. She is a family sim, wants to have her 3 children to graduate with honors although she doesn't have any children yet (I doubt though that they will even go to the university). Yet she wants to have a little fun before finding her love (it is very likely that she'll have plenty of it through her lifetime, perhaps even too much, though). Lucky enough - she moved on New Year's Eve, so the party was a must. 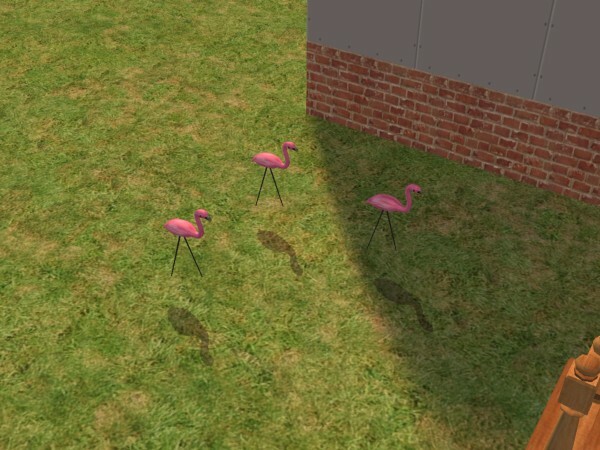 Also, she figured that her family should have flamingos, actually that every one of the members should have 3! She doesn't know why exactly she wants that. Perhaps because she bought them for her, and wanted a pair and that she is a family Sim. She made a friend who's name's Gilbert. They tried having fun, but the party was a disaster. Well, you can't have everything... The time was ticking though, and she wasn't getting any younger. These things and the fact that she really wanted to fall in love led her to make a decision to have some more fun, but in Downtown.